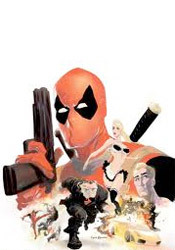 Well, I suppose if there had to be a MAX rendition of Deadpool, the latest character to pass through Marvel’s shovelware-inspired publicity department, they could’ve chosen much worse than David Lapham. As coincidence would have it, I’m right in the midst of re-reading Lapham’s self-published classic, Stray Bullets – first time in ages – so that probably gives me a good frame of reference as to how seriously he’s taking this project. Is this the same guy that blew me away with that charming, bloody series and his recent work on Terror, Inc. or is it a pale impersonation, out for the easy cash grab with one of the publisher’s most over-published modern characters? Let’s find out together! For some characters, a spinoff MAX series delivers new life, a fresh start, a different perspective. The Punisher was on life support, subsisting on a joke of an ongoing series in the Marvel Knights line under the watch of a carefree Garth Ennis before getting the M-Rated reboot. The change in scenery invigorated both character and author. Without a mass audience tag to hold him back, Ennis returned to form, abandoned the limp-wristed superhero satire he’d been investigating, then put the guns back in Frank’s hands and the scowl back on his face. For others, like Blade or Nick Fury, a MAX run provided little more than just another brief mini-series, a diversion before returning to business as usual. To his credit, Lapham follows the mould of the former: he isn’t satisfied with telling the latest in a series of wacky Deadpool stories. He’s here to put his own stamp on the well-worn crimson visage of Marvel’s foul-mouthed mercenary ninja, and he aims to do so via a long, intertwining series of myths and legends, keeping Wade Wilson himself out of the spotlight unless absolutely necessary. Whispers and rumors provide testimony to the assassin’s all-world skill level, with his targets’ level of paranoia proving they’re more truth than fiction. It’s a more grounded tale than most of Deadpool’s previous exploits, which admittedly isn’t saying all that much, although it certainly isn’t without a few moments of gratuitous excess itself. The issue’s visuals, provided by fellow indie writer-artist Kyle Baker, make for an awkward match. Baker’s artwork feels limited and rushed, like a quick set of layouts hammered out on bar napkins over the course of a long, drunken night on the town. His style floats from loosely realistic to grotesquely exaggerated, with the two extremes coming gracelessly face-to-face in more than one panel. As the issue wears on, the quality of Baker’s work degrades further and further, like a descent into madness. One would think that such a style would lend itself nicely to a crazed, chaotic blast of melee action, of which there are several in this tale, but even in that situation Baker disappoints, with a stiff, uncoordinated effort. It’s just a bad visual showing from start to finish. Despite David Lapham’s early-issue attempts to base the issue in a more vivid, realistic world, around the midway point it transforms into something more on par with a hallucination. It moves quickly and recklessly, lurching from one awkward motif to the next, and never quite finds that sweet spot to curl up and get comfortable in. Is this an espionage story? An action series? A black comedy? Perhaps all of the above? Yes and no – it tries them all on for size, but none makes for a good fit. Maybe this series will find its stride after it’s notched up a few more kills, maybe not. Right now it’s merely taking wild stabs in the dark, desperately searching for an elusive personality and masking its indecision with buckets of bloodshed and the occasional bad joke. A crazed ride, if not a particularly memorable one, and not something I’d count among Lapham’s best efforts. Flip through it.